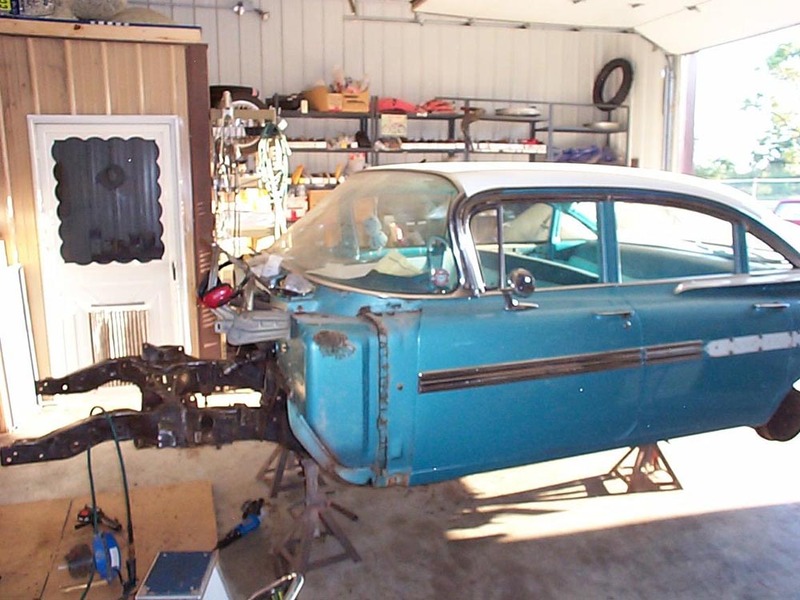 Jim's restoration of a 1959 Chevrolet Impala is documented in photos with captions over the next few pages. Click the photos for an expanded view of each. Entertainment: Buddy Holly, Richie Valens and the Big Bopper are killed in a plane crash. "The day the music died". Ben Hur with Charlton Heston won the academy award for Best picture. Walt Disney releases Sleeping Beauty. On the radio, Sea of love, 16 candles and Mack the knife were popular. Wagon Train, Gunsmoke, Bonanza, The Twilight Zone, and Have gun will travel were popular on the TV set. For the first time, you could watch TV and enjoy the new "Jiffy pop" popcorn. There were 3,287AM radio, 578 FM radio and 509 TV Stations in the USA. In the news: President Dwight D. Eisenhower signs legislation admitting Alaska and Hawaii to the Union as the 49th and 50th states. New on the market are "pantyhose". The Barbie doll makes her debut to the delight of little girls nationwide. The BIC ballpoint pen is introduced. NASA picks the seven Mercury Astronauts. The microchip is invented by Jack Kilby and Robert Noyce of the U.S.A. There are 36,981 motor vehicle related deaths. and in the air, there were 8 commercial accidents resulting in 125 fatalities. Politics: New Best Friends. Iran & the USA sign an economic treaty. USA cost of living: Gasoline was selling for about $0.20 per U.S. Gallon. The median USA household income was $5,417.00. The cost of a first class stamp was $0.04. The average worker earns $91.00 per week. 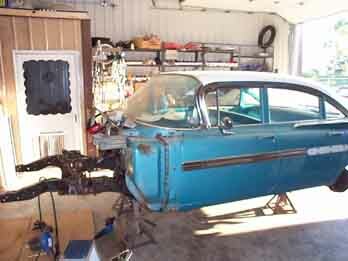 The story of the restoration of Jim's Impala begins here. There are seven pages with step by step images and descriptions. Left-click directly on any of the images to enlarge them to full screen. At the bottom of each page, you may click to navigate to the next page. 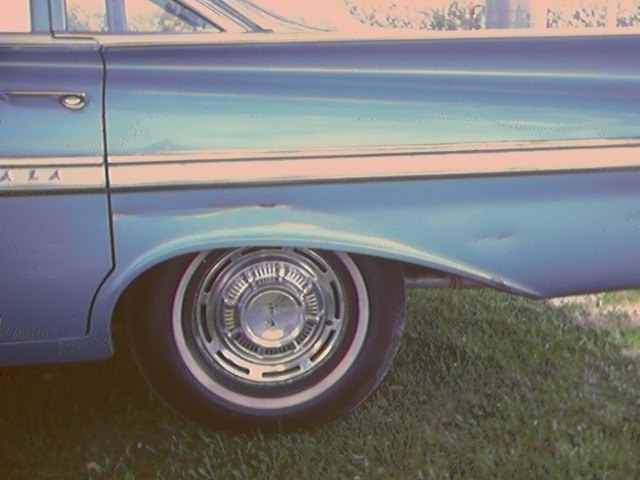 To see this car after the restoration, go directly to page seven from the bottom of this page. 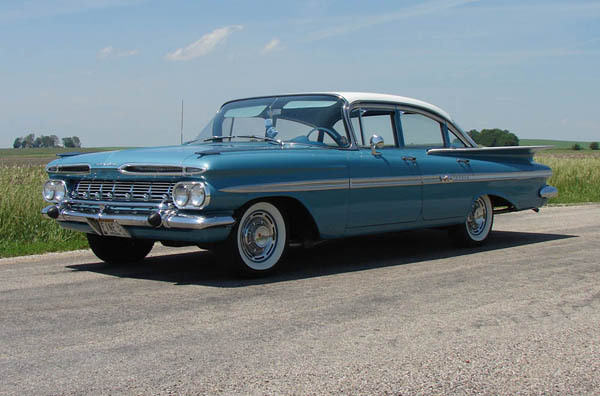 In 1959, Impala was the top of the Chevrolet line, and the color "Crown Sapphire" is one of the most rare. The majority of 1959 Chevrolets were basic Belair, or Biscayne models, and the colors were commonly earthen hues. The original interior was in remarkable condition. 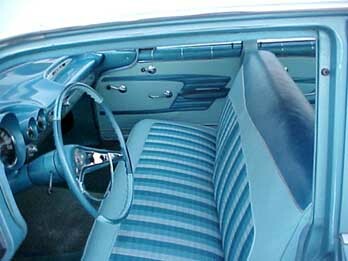 Impala interiors were more colorful, and used higher quality materials than the Bisayne, and Belair models. The car was stored in a heated garage without exposure to sunlight and temperature extremes. The windows, and vents were closed which prevented mouse infestation, insect, dust, and mildew damage. At some point in time, the original owner had a minor accident on the left rear quarter panel. 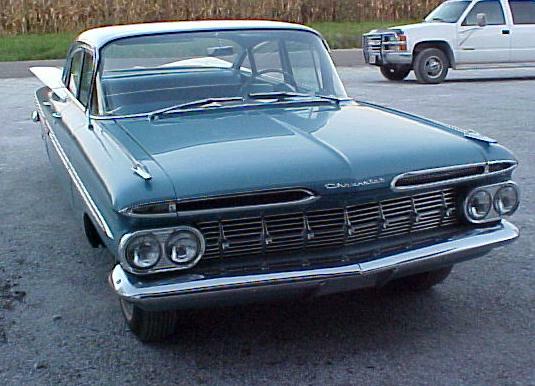 The condition of the exterior trim, chrome, and stainless steel parts were well above average. 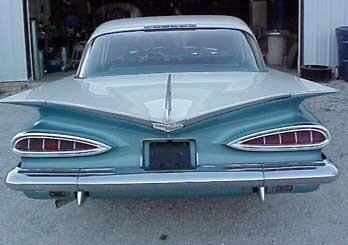 The original rear bumper was in perfect alignment with minor scrape damage. Both lower valance panels had minor curb damage. There was a small "parking lot" crease in the two right side doors. 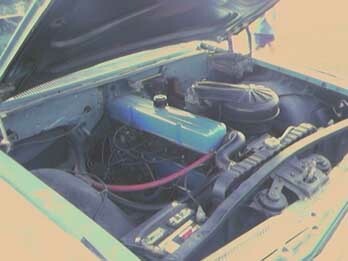 The engine compartment was mostly original, and no modifications were made to any of the components. The original optional oil bath air cleaner is visible in this photo. This Impala features the standard 235 CID six cylinder engine, with manual three speed transmission. In the right side view, one can see that the original battery cables are still in use. 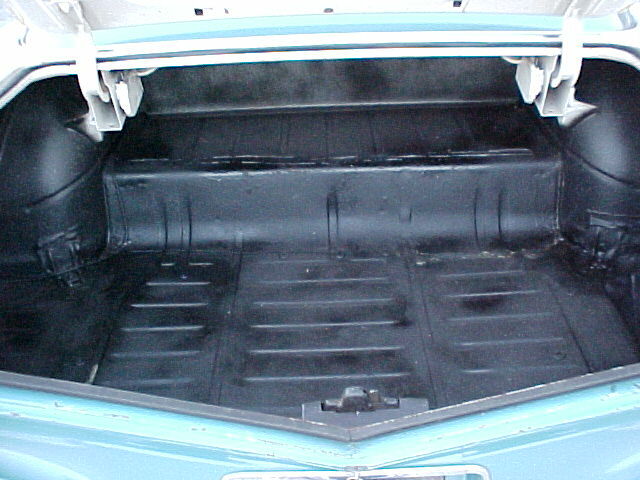 The trunk floor was undercoated at some point in time. The condition of the floor was very good. These model years of GM cars are prone to trunk leaks. At some point water had stood under the mat in the recessed areas. Small pin holes, and surface rust required that a new trunk floor be installed for the best solution. March 2004. 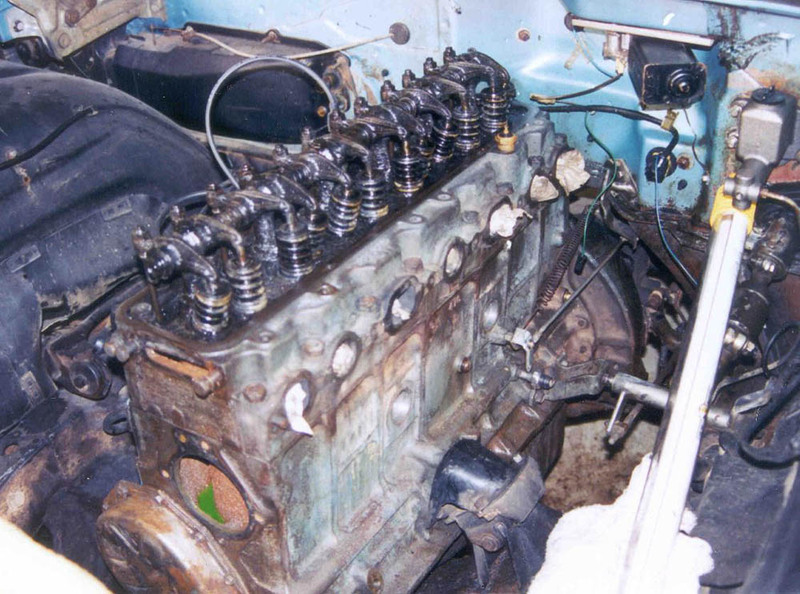 When a car sits for 35 years, the interior of the cylinder walls rust. The engine freezes in place as the pistons stick to the accumulated rust. Rubber seals dry out and deteriorate. Electrical parts freeze in place. 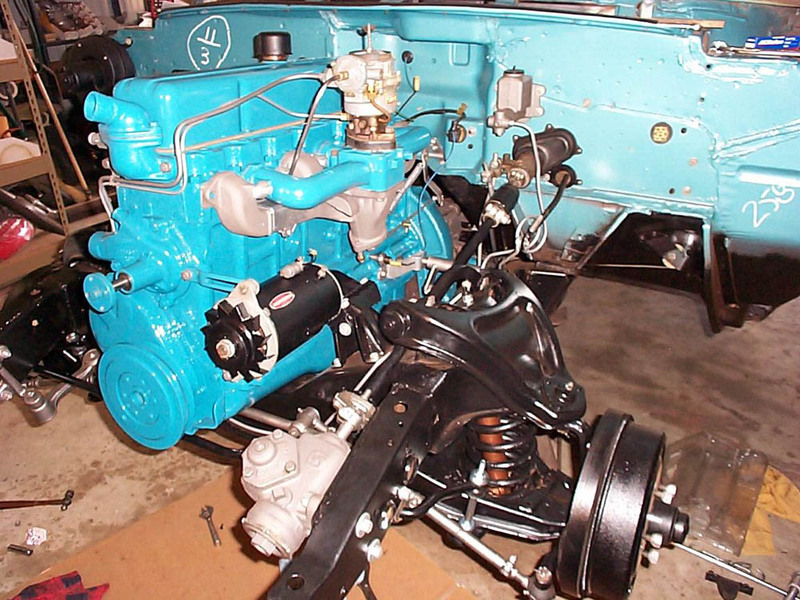 On a restoration of this type, it is best to completely disassemble every component of the auto, inspect, clean, and rebuild or replace as necessary. On a low mileage auto, sometimes, only cleaning and lubrication is necessary. This left side view shows the engine after initial tear-down in preparation for removal from the chassis. 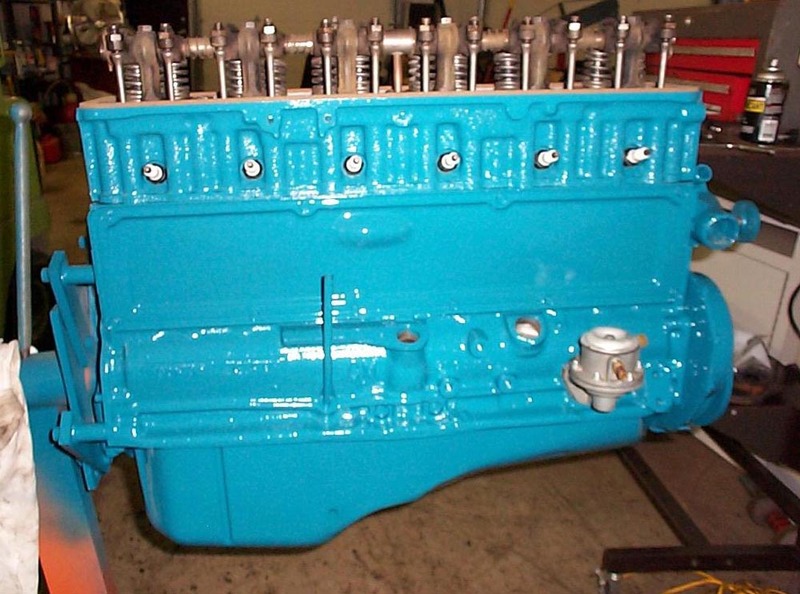 This is a view of the rebuilt engine during the installation process. 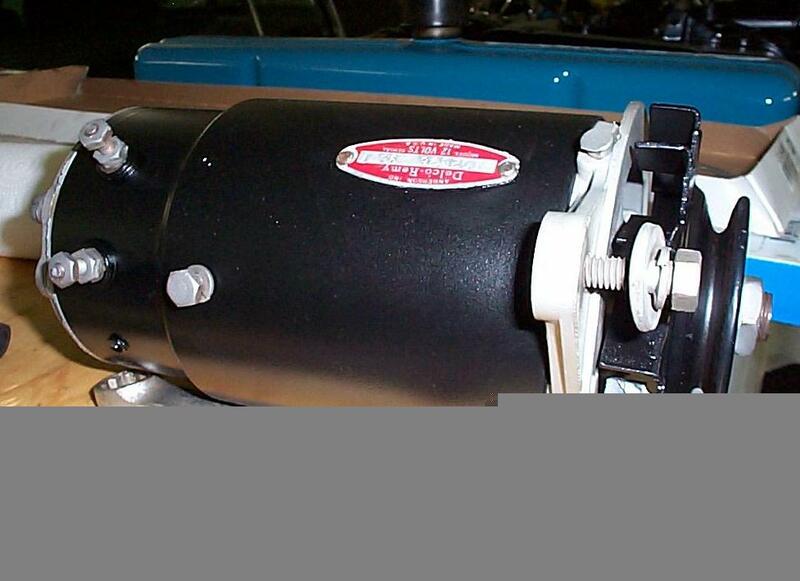 The exhaust manifold was sand blasted, and painted with "cast iron" paint. This special paint gives the look of natural cast iron, has a very high temperature capability, and prevents rusting of these components. 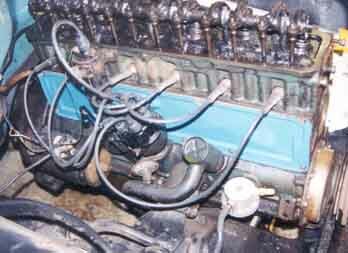 This right side view shows the engine after initial tear-down in preparation for removal from the chassis. This is a view of the rebuilt engine during the installation process. 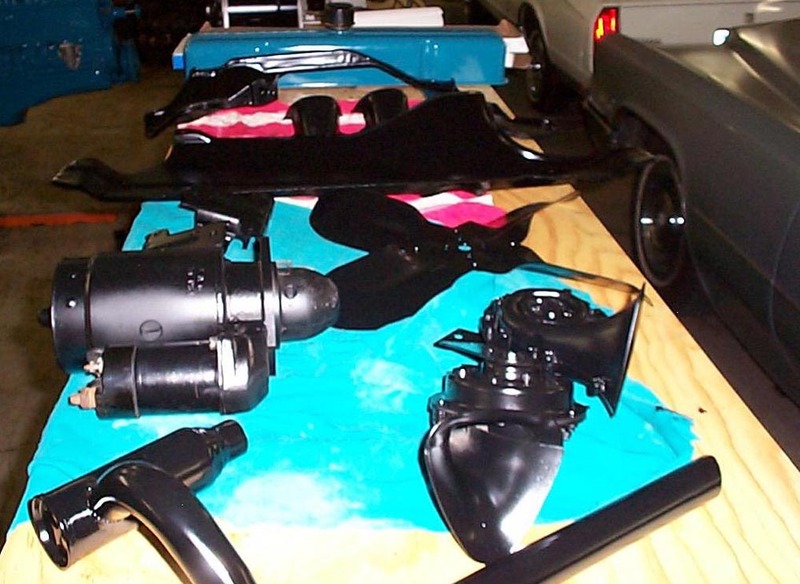 This photo shows the engine compartment components ready for installation. 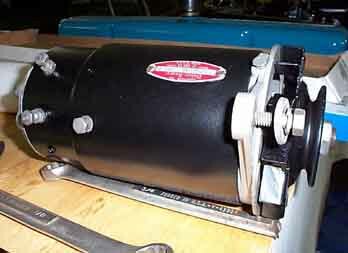 The generator was disassembled, inspected, cleaned and painted. The condition of these components are further evidence that the car has very low miles. 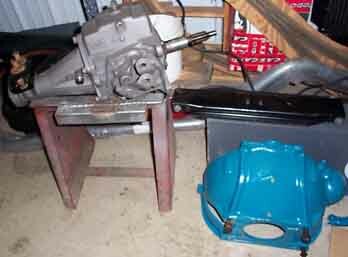 The three speed transmission was disassembled, cleaned and inspected. The condition of the transmission was remarkable. 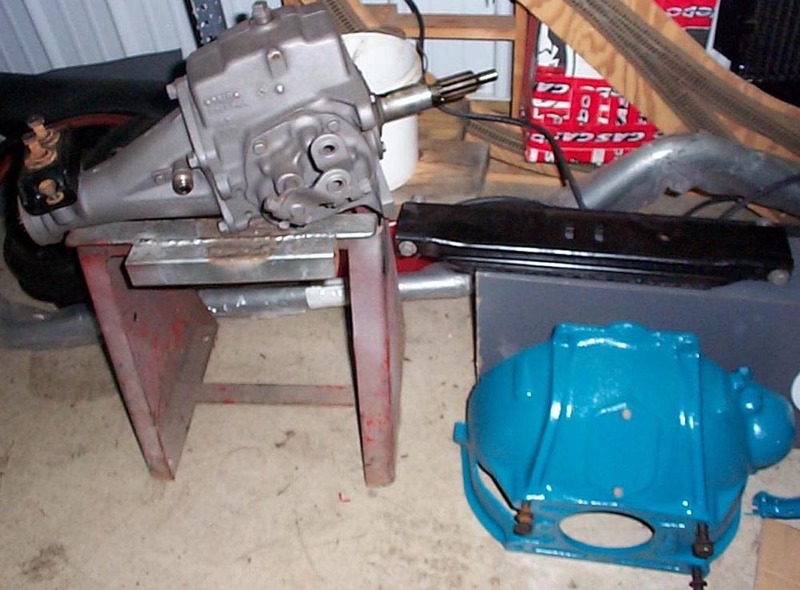 The transmission was painted with "cast iron" paint. This paint was purchased from Bill Hursh products. This special paint gives the look of natural cast iron, has a very high temperature capability, and prevents rusting of these components. 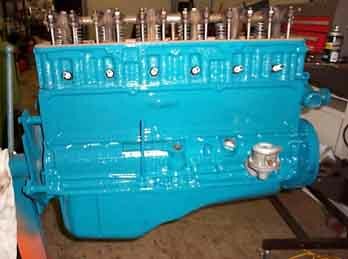 Because of cylinder wall rust, the engine required an oversize bore, and new pistons. 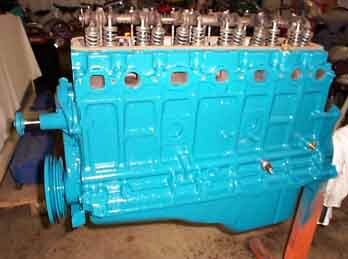 Rebuilt by Mike's machine shop in Kentland Indiana. Bored 0.003, new pistons, camshaft, lifters, and timing gears. A mild "RV" torque cam was installed to enhance low RPM power. 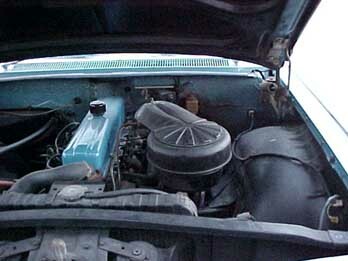 The cylinder head was modified with hardened valve seats for use of unleaded gasoline. 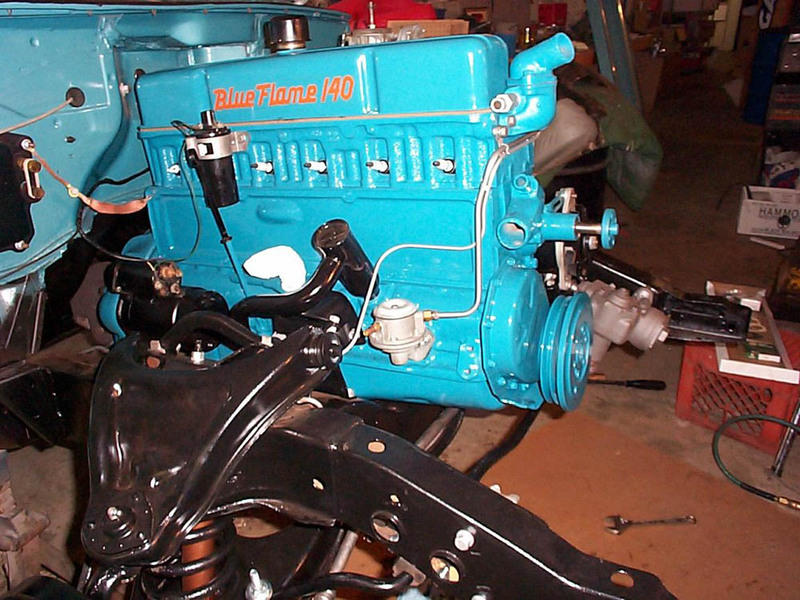 The engine was painted with high temperature enamel from Bill Hursh products. August 2004. A decision was made to not remove the body from the frame. As the underside of the car was very solid, and the frame was exceptionally clean. 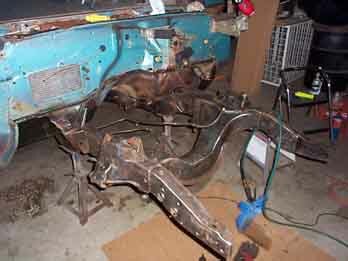 The entire front frame was stripped of components, and cleaned with a power wire brush. All components were cleaned, rebuilt as necessary, painted, reconditioned, and prepared for re-assembly.